St Joseph’s Primary School is very fortunate to have close links with St Mary’s Church, Cadogan Street, Chelsea. The origins of St Mary’s were close to the present church, on a ninety-nine year leasehold site at 105 Cadogan Gardens (then known as Cadogan Terrace). This is where, in 1812, the first Catholic Chapel in Chelsea, and one of the first in the country since the Reformation, was erected. It had been established by Abbé Jean Voyaux de Franous, who arrived in London in 1793. The Abbé had been given special charge of the spiritual welfare of the veteran soldiers at Chelsey Colledge (now known as the Royal Hospital and the home to the ‘Chelsea Pensioners’ – so conspicuous by their scarlet uniforms) as well as the soldiers at the Chelsea and Knightsbridge Barracks. He had launched an appeal for funds in England and in France to build the chapel which he intended to be primarily for the use of soldiers and the veterans of the Royal Hospital. When the Abbé died in 1840 after 40 years of service to his parish, his work was continued by many dedicated people including, especially, Joseph and Mary Knight. They planned a Catholic foundation in the parish and purchased, for £5,000, two and a half acres of land, which had formerly been the Wellington Cricket Ground. 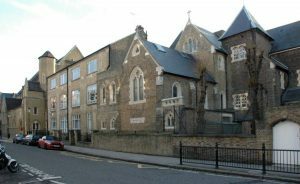 This is now the Cadogan Street/Draycott Terrace site, which contains the current Church together with St Joseph’s Primary School, St Thomas More Language College and the St Joseph’s Almshouses. Augustus Welby Northmore Pugin (1 March 1812 – 14 September 1852) was an English architect, designer, artist and critic, chiefly remembered for his pioneering role in the Gothic Revival style; his work culminated in the interior design of the Palace of Westminster. Pugin designed many churches in England, and some in Ireland and Australia. Pugin was the son of Auguste Pugin, and the father of E.W. and Peter Paul Pugin, who continued his architectural firm as Pugin and Pugin. Included in Pugin’s list of principal buildings within the UK is the Convent of St Joseph, school and almshouses, Chelsea, London (1841) – altered; used as a school.